Delaware is home to 20 different snake species that live in a variety of habitats and exhibit a diverse array of body plans. All serve important roles in their ecosystems, and only one species is considered dangerous to humans. Five species of small, inoffensive species inhabit the leaf litter in Delaware. Northern ringneck snakes (Diadophis punctatus) feature an orange, yellow or red neck-ring and have weak venom used to incapacitate worms, salamanders and small snakes. Eastern worm (Carphasphis amonenus) and Eastern smooth earth (Virginia valerius) snakes are brown- or gray-colored predators of worms and other invertebrates. Northern brown snakes (Storeria dekayi) and their congeneric relatives the red-bellied snakes (Storeria occipitomaculata) live under leaves and debris, preying on snails and worms. A number of aquatic and semi-aquatic species are native to Delaware. Two water snakes of the genus Nerodia live in and around the ponds, rivers and creeks of the state: the northern water snake (Nerodia sipedon sipedon) and the plain-belly water snake (Nerodia erythrogaster). The queen snake (Regina septemvittata) is restricted to very clean waters where it eats freshly molted crayfish. Additionally, both the eastern garter snake (Thamnophis sirtalis) and eastern ribbon snake (Thamnophis sauritus) live in the marshes, fields and riparian areas of Delaware. Corn snakes (Pantherophis guttatus) are a type of rat snake -- sometimes referred to as red rat snakes -- that live in the forests and suburban areas of Delaware. Delaware is also home to one of the longest snakes in the United States; black rat snakes (Pantherophis obselota obselota) occasionally exceed seven feet in length and prey on rodents, birds and eggs. Black racers (Coluber constrictor) are generally uniform black dorsally, and are sometimes confused with black rat snakes; you can identify them by their smooth scales that differ from the rat snake’s keeled scales. Eastern kingsnakes (Lampropeltis getula getula) are glossy, black snakes with a yellow or white chain-link fence pattern on their dorsal surface. Eastern kingsnakes are generalist predators, but they will eagerly consume other snakes -- including venomous species. Three varieties of milk snake are found in Delaware: the coral snake mimic scarlet kingsnake (Lampropeltis triangulum elapsoides), the eastern milksnake (Lampropeltis triangulum triangulum) and the coastal plains milksnake (Lampropeltis triangulum triangulum x elapsoides), which is a naturally occurring intergrade between the eastern milk snake and scarlet kingsnake. Additionally, the scarlet snake (Cemophora coccinea) -- another tri-colored species like the scarlet kingsnake -- lives in Delaware and consumes reptile eggs. 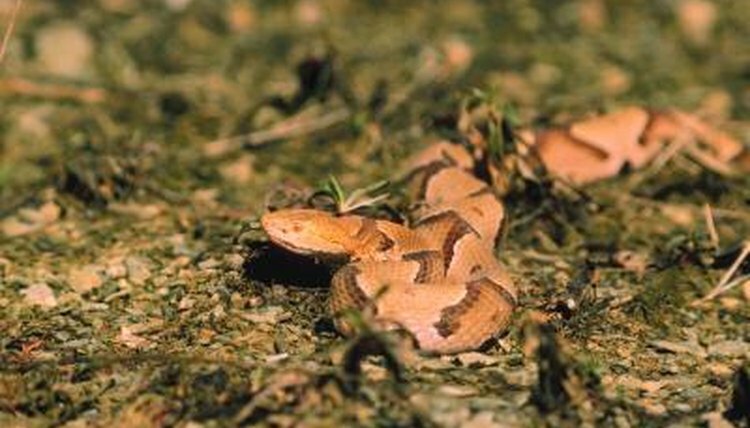 The northern copperhead (Agkistrodon contortrix mockasen) is the only venomous snake found in Delaware. These pit vipers frequent rocky outcroppings, though they also live in swamps or riparian areas. Copperheads are extremely well camouflaged snakes that blend in perfectly with forest leaf litter. Though dangerous, copperhead bites are rarely fatal. Hognose snakes (Heterodon platirhinos) are diurnal snakes that consume toads almost exclusively. Equipped with fangs in the rear of their mouth used to puncture their amphibian food, hognose snakes exhibit a complex defensive repertoire that includes hissing, displaying a small hood and feigning death. Rough green snakes (Opheodrys aestivus) are long, slender snakes that live in bushes and trees where they hunt insects. Rough green snakes are the only completely green snake found in Delaware. The large and boisterous northern pine snake (Pituophis melanoleuca) historically inhabited the region, though it is thought to have been extirpated from Delaware.